Filquip is a local Australian supplier of Mobile Bulk Bag and Shipping Container Unloader Skids for the transfer of powder, granule and bead products into storage silos and hoppers. 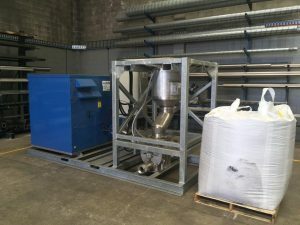 The skid units consist of a bulk bag unloader on the frame which is removable to allow the connection of a container unloader spout, the skid is structurally certified and movable around site with its forklift lifting points. 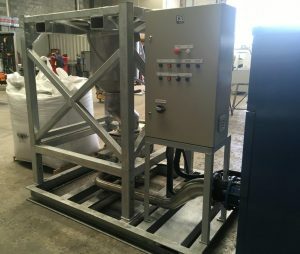 The packaged skid has a 30kW Positive Pressure Blower with Acoustic enclosure that provides the moving air through the stainless steel piping to convey the product from the hopper and rotary valve to a camlock connection point for transfer into the site silo or hopper. Includes integrated local control panel with VSD and dial for adjusting the conveying throughput.